If your spouse has a bad credit history, you undoubtedly want to help them build a better one. Perhaps you want to qualify for a mortgage together, or maybe your spouse’s credit trouble is keeping them from getting a job. Or, if nothing else, you want your spouse to have better credit because you want the best for them. There are so many benefits of a good credit score, why wouldn’t you want to help your spouse improve theirs? Here are some things you can do. When flight attendants give their safety speech, they always say that you should fix your oxygen mask before assisting others. You can't help someone else survive if you're struggling to breathe yourself. If you and your spouse both have bad credit, you can rebuild credit at the same time. But don't neglect your own credit. The foundation for building a good credit score is good money management habits. That starts with having a budget or a plan for spending your money. If you don't already have one, create a budget based on your income and your expenses. A budget will allow you to see whether you have enough money to pay the bills. Raise your income or reduce your expenses to make up for spending gaps. Work together to build a household emergency fund that you both have access to. The emergency fund keeps both of you from relying on a credit card, or a more expensive loan, to pay for unexpected expenses. And, if you or your spouse use a credit card to pay for an emergency, use the emergency fund to pay off the balance immediately. The ideal emergency fund is three to six months of living expenses, but you can start out with a smaller goal of $1,000 and work your way up to higher savings. Help them understand credit bureaus, credit reporting, and credit scoring. 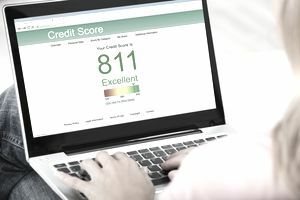 Explain the relationship between creditors and the credit bureaus, how late payments don't go unnoticed, and how low balances and timely payments help build a better credit score. Review your credit reports together, but don't scrutinize or berate your spouse for past mistakes. The goal is to identify the negative items to fix and come up with a plan to fix them. You might be surprised to find mistakes on your own credit report. Some of the worst types of credit report entries are debt collection accounts, past due balances, tax liens, foreclosure, bankruptcy, or student loan default. You can get a free copy of your credit reports through AnnualCreditReport.com. Having too much consumer debt can hurt both your credit scores. Use your credit reports and other billing statements to create a list of your debts. Then, make a plan to pay down the balances. It’s often best to pick a debt to get rid of first by paying as much as you can toward that balance while paying the minimum on all the others. Use your good credit to help boost your spouse’s credit by making your spouse an authorized user on one (or more) of your credit cards. Once you add your spouse as an authorized user, the history for that account will appear on your spouse’s credit report. Make sure it’s an account with a good credit history, or your efforts will backfire. You’ll apply for the credit card together, and the credit card issuer will review both your credit histories to approve the application. As a joint account holder, you and your spouse are jointly liable for the balance. If either of you fails to make payments on the account, the creditor can go after the other spouse for the balance. By comparison, when your spouse is just an authorized user, the creditor uses only your credit history to set the credit card terms and only holds you liable for charges made on the card. Federal law requires credit card issuers to ask for personal income instead of household income when they’re approving credit card applications. If your spouse doesn’t have his or her own income apart from yours, he or she won’t be able to get approved for a credit card. Sharing a credit card requires much communication in how you'll use and pay the card. Upfront, have a discussion about purchase limits and payment habits to prevent conflict. A secured credit card is another option for rebuilding bad credit history. The hardest part about getting a secured credit card, apart from having personal income, is coming up with the security deposit. Review your household budget and figure out how you and your spouse can come up with a good security deposit. Some secured credit cards accept a security deposit as low as $200. Once your spouse has a credit card, whether alone or with you, it’s important that he or she exercise good credit habits. That means charging only a portion of the credit limit and paying the balance in full and on time each month. Remind your spouse to pay the balance each month. Or better, pay your bills together each month.